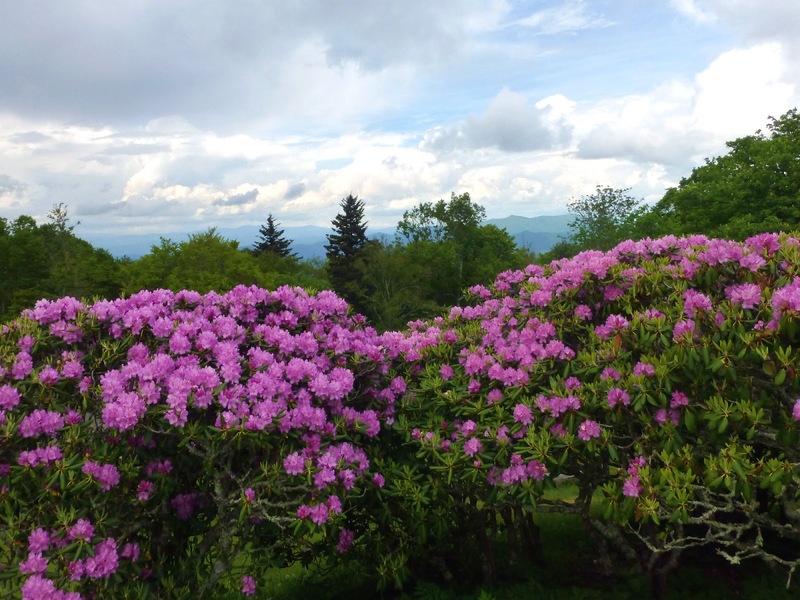 Combine a scenic drive along the Blue Ridge Parkway — complete with beautiful blooming rhododendron and photogenic verdant ridges — with a picnic lunch and short hike, and you have what we consider the perfect June afternoon in western North Carolina. 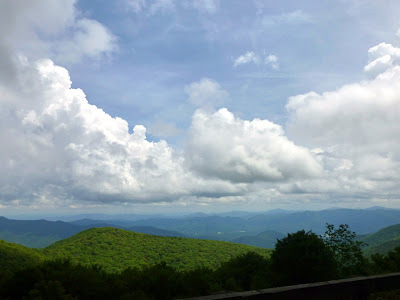 One option to make this day trip happen is to head north of Asheville to Craggy Gardens, specifically, the Craggy Gardens Picnic Area. Craggy Gardens is a 700-acre Natural Heritage Site and part of the Craggies, a section of mountains between Asheville and the Black Mountain range containing vertical, exposed rugged rock. You can see the Craggies easily from the charming town of Black Mountain just west of the Inn on Mill Creek B&B. 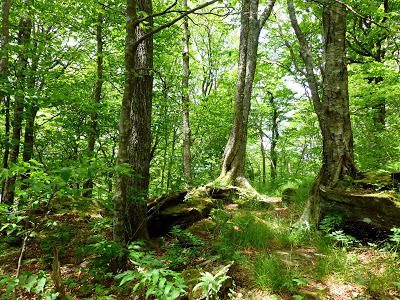 The Craggies rise more than a mile in elevation and, along with the rocky features, include gorgeous northern hardwood forest with yellow birch, beech and mountain ash trees (among others) and balds covered in native grasses and rhododendron. 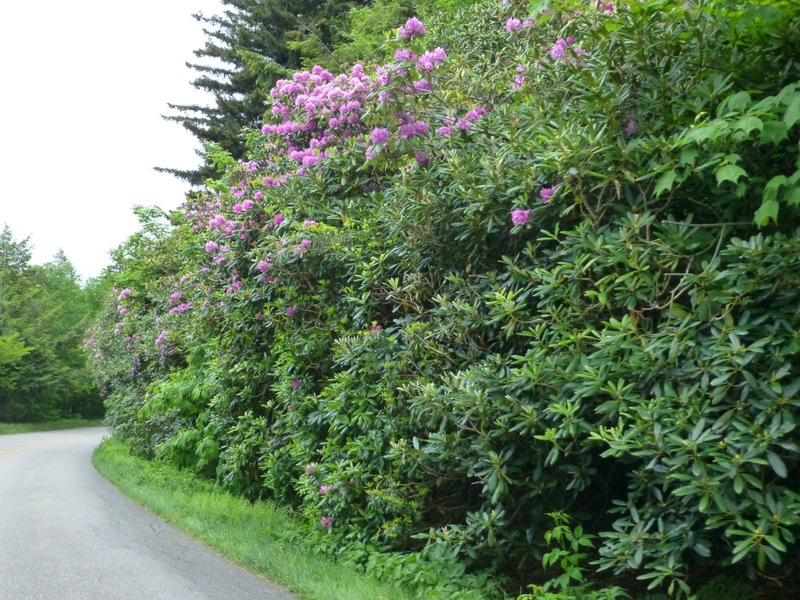 As an aside, there are a few different types of rhododendron in the area; Catawba Rhododendron are the hot pink standouts that you’ll see blooming in June along the Parkway. 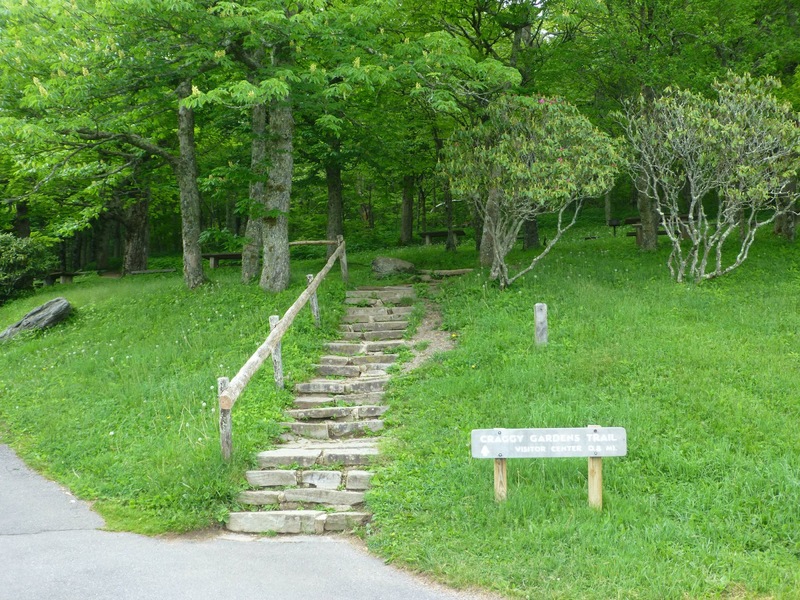 Craggy Gardens consists of a picnic area, hiking trails, overlooks and a visitor center. It has some of the best views of the Asheville/Black Mountain area in our opinion. 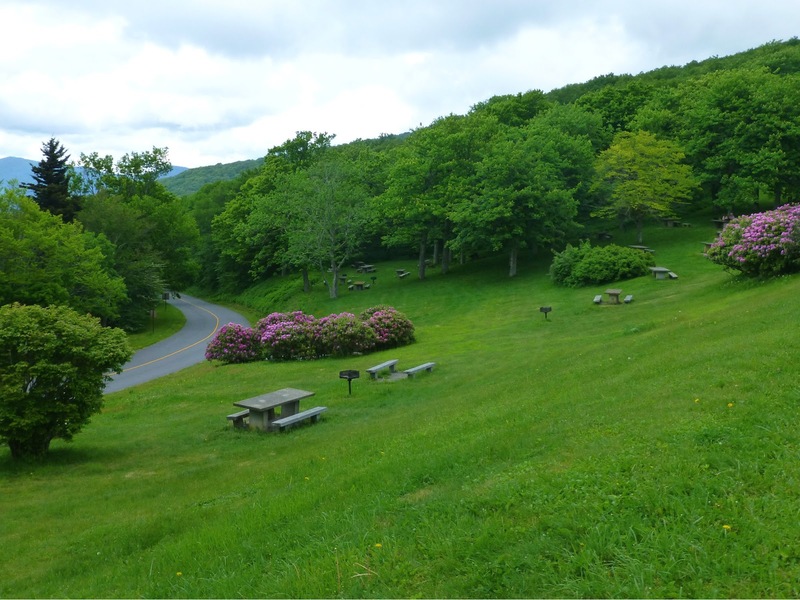 Heading along the Parkway, about 15 miles north of Asheville, you’ll reach Milepost 368 and just beyond that is the entrance to the Craggy Gardens Picnic Area on the left. Drive a short distance, heading to the right when the road splits, to the parking area. 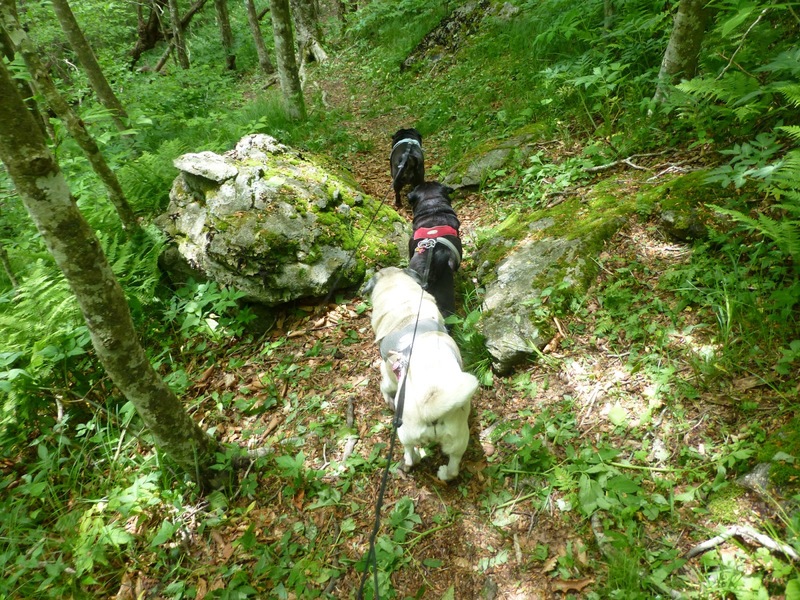 Then treat yourself to a pretty view while having lunch and get ready for a short, pleasant hike! 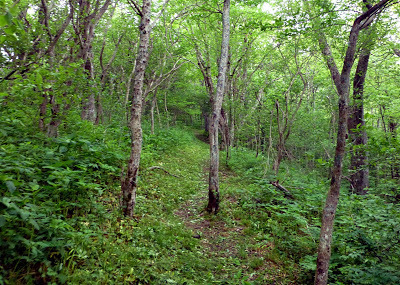 The Craggy Gardens Trail is an easy-to-moderate trail leading east to the Craggy Gardens Visitor Center, located further up the Blue Ridge Parkway. It’s an out-and-back hike, so you can alternatively start at the Visitor Center and hike west to the Picnic Area. The trail shares its path with a section of the Mountains-to-Sea Trail (MST) that runs 1,150 miles from, you guessed it, the North Carolina mountains to the coast on the eastern side of the state. The trail begins through the woods and you can either head west on the MST or east on the Craggy Gardens Trail/MST. 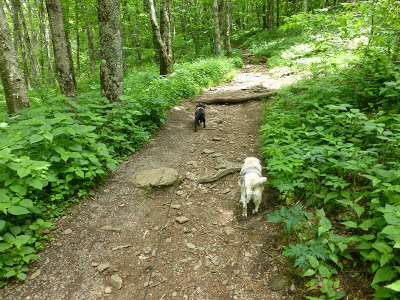 Blue Ridge Parkway trails are pet friendly, so the innpugs accompanied us the most recent time we went, and as usual, we use them as a gauge on how wide a trail is. The Craggy Gardens Trail is sometimes more than two pugs wide, and occasionally narrows to a one-pug-wide path. 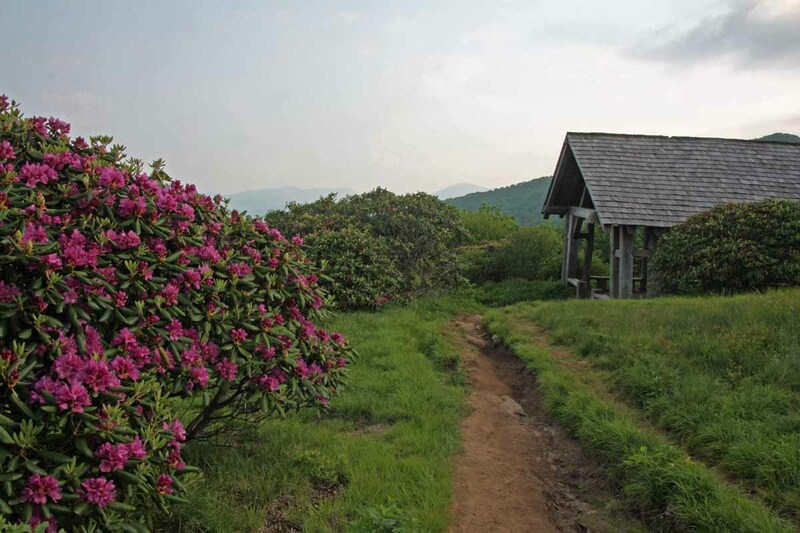 The Craggy Gardens Trail take you on a gradual incline a little more than half a mile through the woods and into a more open area, to a rustic trail shelter built by the Civilian Conservation Corps in the 1930s. A short spur trail on the right leads past a rhododendron-laden bald to an overlook. Beyond the shelter is a 1/3-mile descent on a nature trail to the Craggy Gardens Visitor Center.A few items to note about hiking around Craggy Gardens: The temperature is usually 10+ degrees cooler than Asheville (and at the Inn on Mill Creek B&B 25 minutes east of Asheville). This is great in the summertime! Also, the Craggies are host to many fragile plants, some of which are endangered, so it is very important to stay on the marked trails so that future hikers and nature lovers will be able to enjoy this beautiful area. 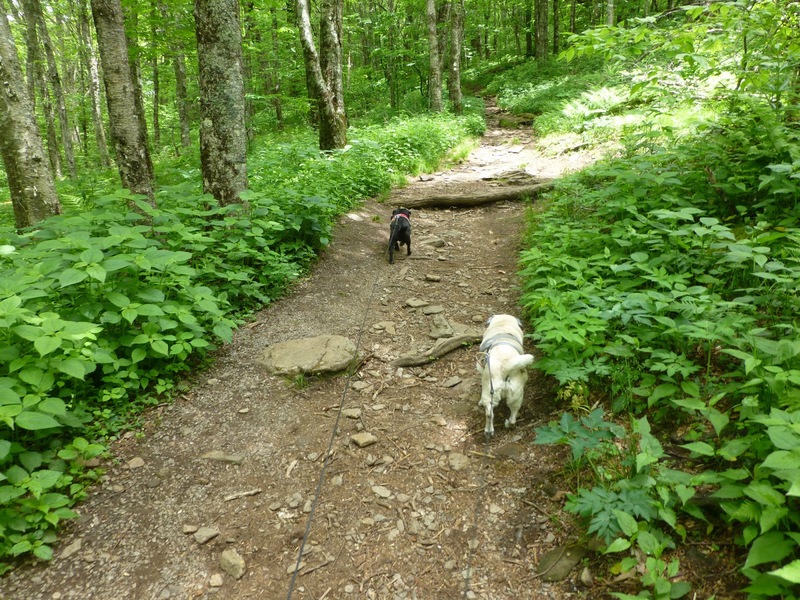 This entry was posted in Blue Ridge Parkway, Hiking and Waterfall Trails and tagged Blue Ridge Parkway, flora and fauna, hiking, Spring, Summer by Inn on Mill Creek. Bookmark the permalink.